This is my book from Paraguay for the Read The World challenge. I previously bought a copy of I, the Supreme by Augusto Roa Bastos, but that’s a fat dense modernist novel and it defeated me. I always find it frustrating reading poetry in translation. I mean, even with English-language poetry I often find myself uncertain, not knowing what to think; with translations you get the added bonus that you know that something will be missing, but you never know what. And with a selection of different poets but only one translator, there’s the added worry that the influence of the translator will make them all sound alike. In other words: nothing here grabbed me the way that poetry sometimes can. But there were certainly things to enjoy. And in fact I’ve been enjoying dipping in and out for this post more than I did on the first read-through. loses its force and colour. looks old in the sun. of a yellow reflection in a small dark beak. A bit of a mixed bag, then, which perhaps is what anthologies should be; but certainly quite a lot of things I liked. » I got the photo from Flickr; it shows the confluence of the Río Paraguay and the Río Paraná. 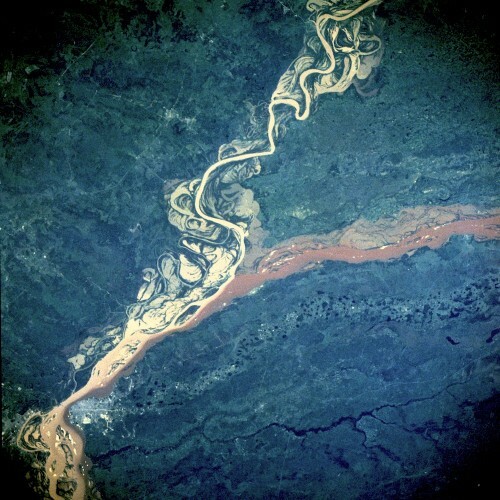 The two rivers mark the border between Argentina (to the south and west) and Paraguay. So the photo is mostly Argentina; but it’s a nice image. It is © NASA Goddard Space Flight Center and used under a CC-by licence (although actually I think NASA photos are in the public domain automatically? ).